Self care and taking time to slow the pace of life seems logical and I am sure we all agree it is important. I think it becomes even more critical when healing from personal loss or tragedy. Yet, it seems as difficult as ever to “make time” for some quiet time. Sometimes taking a break to shut out all of the distractions and create space for peace and reflection can be a very difficult task. Not only do we typically fill our days to the point of exhaustion, I have also found that making time for quiet reflection can sometimes lead to alone time with grief. Finding that balance between enjoying the freedom of unplanned thought and being cautious of where those thoughts might lead. A little while ago I had the opportunity to spend the day by myself. A very rare occurrence. After filling my morning with running errands I made a very hard stop and chose to spend the afternoon on some much needed self care and reflection. I have had this desire to take a blanket and a book and curl up under a beautiful tree somewhere for a very long time. A seemingly very simple moment to achieve yet one I previously chose not to make time for. It may seem crazy to some, that I waited years to make time for this, but I did it and it was wonderful. Not only did I find a little peace in the shade of a beautiful tree on a hot sunny day, I also found that the book I chose to grab and read was full of messages that I needed to hear. 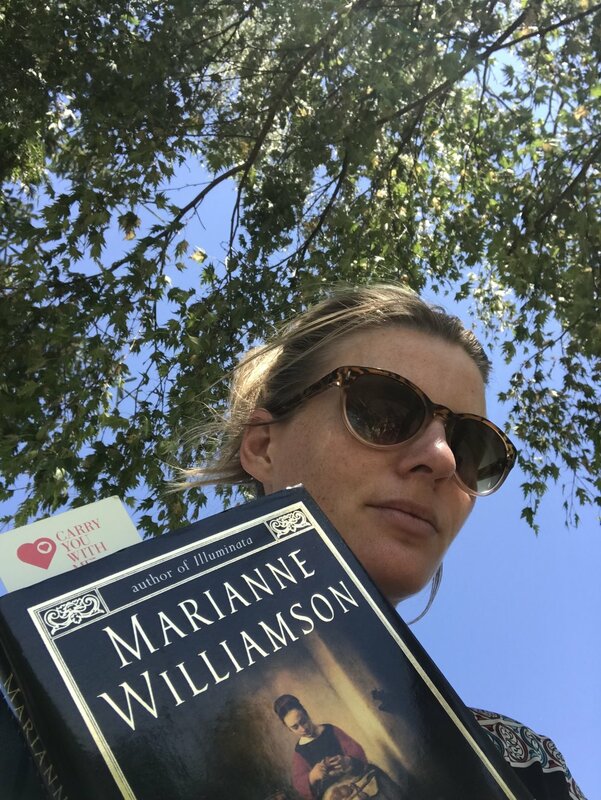 Everyday Grace, by Marianne Williamson was the selected read for that day. I borrowed it from my mother months ago and was looking forward to digging in. As I began to work through the pages I noticed a huge smile creeping across my face. I started bending so many corners and pulled out a pen to start marking up some of my favourite parts (hopefully mom doesn’t mind). I would like to share some of the lines from this wonderful book that have really stuck with me these past couple weeks. Perhaps some will speak to you as well. I respect so greatly that there are many dark days on this life long journey after child loss and that today may not be a day with space for these thoughts. Take care friends. “We don’t need to push life so much as we need to experience it more elegantly, to be motivated more by inspiration than by ambition” (Everyday Grace, Marianne Williamson, page 55). This may possibly be one of my most favourite quotes and is a reminder everyday on how to approach life. When I focus on inspiration everything I do feels more connected and meaningful. On the days that slips, I seem to stray further towards fear, doubt, competition and unrest. Food for thought. Work in progress always. The next couple of lines really reminded me of this community and experiencing life so differently after losing a child. So many questions that will never have answers. Trying to live in the moment and enjoy the gifts around us. Knowing that the darkness is real but still believing in the light. Even when it can be so hard too. Whether you can find 5 minutes or 5 hours to slip away and find a quiet moment or an activity that helps you connect deeper with yourself, your surroundings, or shines a little light on your day, it might just be worth it. Stay tuned for more self care and inspiration in the coming weeks and months.